I highly encourage this as a DIY if the dealer wants to charge you for it. I did the repair kit install per the TSB in about 30 minutes. It was my first DIY two years ago. The degree of difficulty on a scale from 1 (easiest) to 10 (vey difficult) was a 2. First, I recommend that you try and get your dealer to do this under warranty. This was a known problem and most dealers will still replace the hinge for free. If not, here is a link to the TSB with instructions and part numbers to repair a broken hinge (about 44k PDF file). Thanks Loren. And i just had the car in a couple of weeks ago for the coolant bottle. Oh well back it goes!! Just finished this TSB and got some pictures to go with the words. This is not stand alone, but use them with the TSB. 1. Don't forget to disconnect the tray lock connector before pulling the console out. Remeber to lay back the passenger seat for easier removal or console. 2. 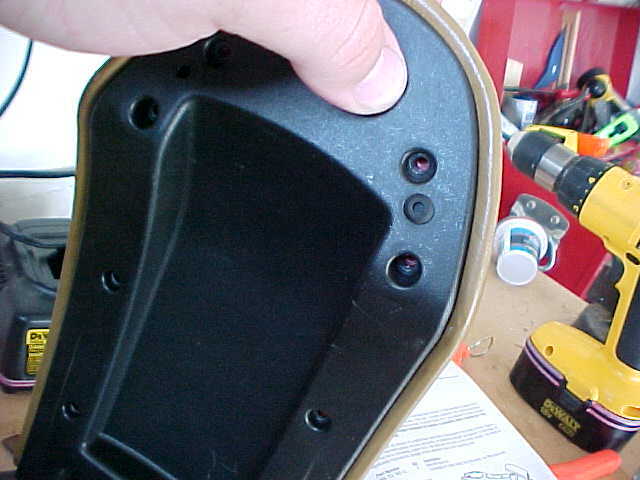 Use the T10 torx screw driver or bit to remove the 8 screws holding the leather top to the plastic cover. 3. Here it is removed, and now the cover looks like without it. 4. One picture above, keep hand for re-assembly. The two phillips screws need to be removed next. 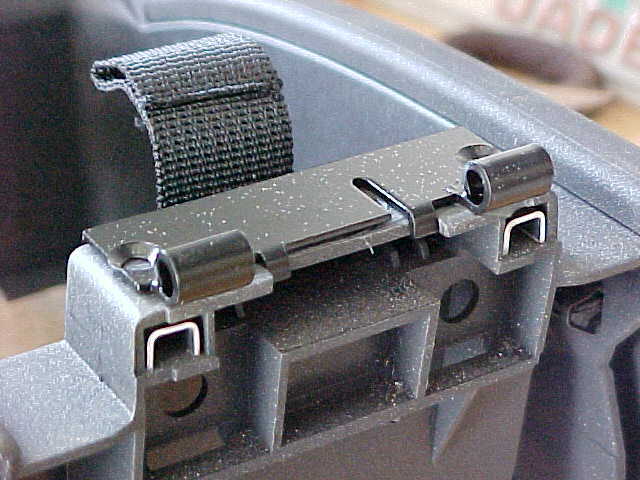 Remove the cover from console, and use a pin tool (Sears sells a set for $10) to knock out pin holding the hinge together. 5. 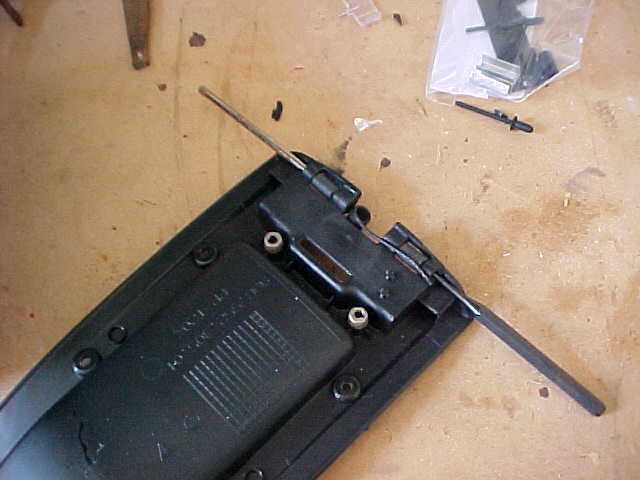 Use a small handsaw to remove the plastic that remains from the old hinge. Sand as needed for smooth, but don't go crazy, the new hinge will cover it. 7. Next set the metal hinge in to position. 8. Next, I used a small spring clamp to hold hinge in place while drilling hole with 5/32" bit (same as 4 mm). The bit should go through the metal as well as the plastic. 9. Follow the TSB to insert the rivet. I purchased from Lowes a Rivet tool for $16.95 shown below. 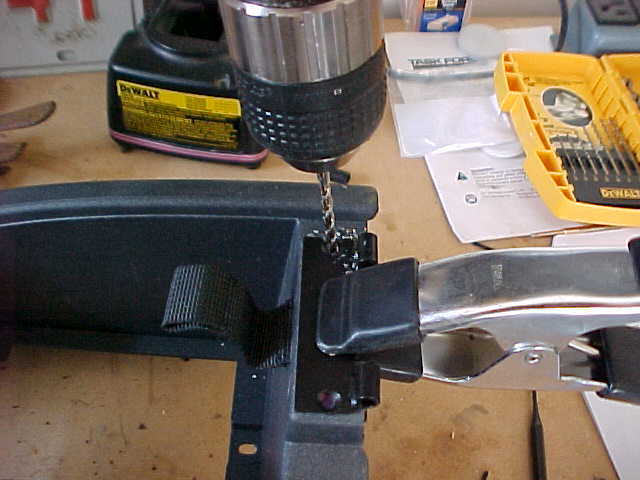 insert the long part of the rivet into the tool and close the handle. That is all you got to do. 10. Re-assembly is the reverse. Push the pin back in, insert the spring, insert the nylon strap, and screw in place. Partial assembly below for reference. These directions were spot on, I just completed mine a few minutes ago. Using the spring clamp made this monumentally easier. Check for screws everywhere. In the armrest box alone there are 3. Under the rubber mat, under the coin holder, and one under the plastic cover that comes off in the base. This requires much more disassembly of the console/dash than I anticipated, but it isn't difficult. Those crazy Germans, why use one screw when you can use 4. Thanks for posting this manual it was very helpful. Those crazy Germans, why use one screw when you can use 4. Why build 4 Shermans when you can build 1 Tiger?! Quality over cost mentality. PS. Ferdinand Porsche designed a hybrid-drive version of the Tiger 1 but lost the production contract to Henschel. Could you please describe where the 4 screws are in order to remove the console.... I found both in the bottom of the tray burt where are the other two???? Two in the tray - one under the liner and the other under the coin holder. 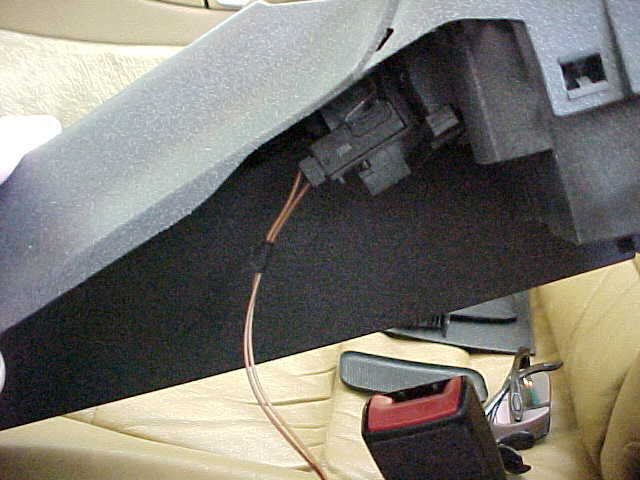 There is one more screw at the very front of the console under the shifter boot and one under the ashtray. The B&M short shifter instructions for this are quite good and have pics for console removal. I just did this on my 01 996 Turbo a couple nights ago. Once I removed all of the screws and the side cover to the emergency brake, I had a tough time getting the console out, even with the passenger seat all the way down. The pictures were taken before I replaced the hinge. You can see on the driver's side photo where the leather has a blackish smudge, the leather to the left of the smudge is the area that got affected. So now, when the brake is engaged you can really see how bad it looks! Man, for something that was supposed to cost me $30, I'm not sure how much this is gonna cost to fix! Sheesh! I found replacement hand brake levers, but they're priced between $200 and about 4 to $500! OUCH!!!! And they weren't even in my color combo! I feel so bad about this! Maybe an upholstery shop? Anybody know any good ones in Chicago, IL? On a side note, I priced out the hinge replacement kit, the cheapest Porsche part I found was for $22.50. With shipping it would have been closer to $30. When I called my local dealership, they told me $38, I asked if they could price match, he said he couldn't go as low as 22.50, but he could do $28, so my out the door price was $30 and some change. Never hurts to ask! Can someone clarify if I need to remove the entire center console? The pictures seems to show the console coming out. 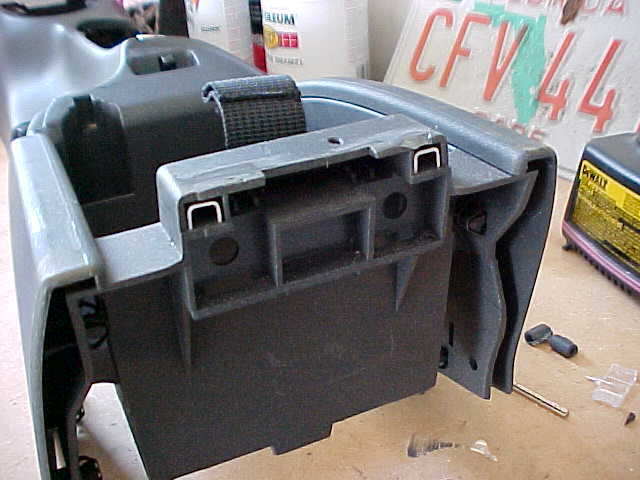 I removed the entire center console, as the pictures and directions suggest. After I did the repair, I thought it would be possible to make the repair without removing the entire console. I would try and repair it without removing the whole thing first, if you determine you need to remove it, then remove it. If you do end up removing it, don't forget to put painter's type tape at the base of your emergency brake to avoid the type of damage I caused mine when I removed it! 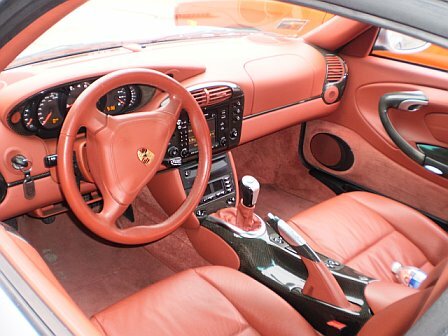 Post back and let us know if you had to remove the whole center console. 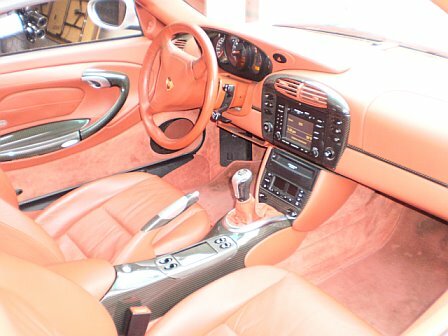 You do not need to remove the center console. 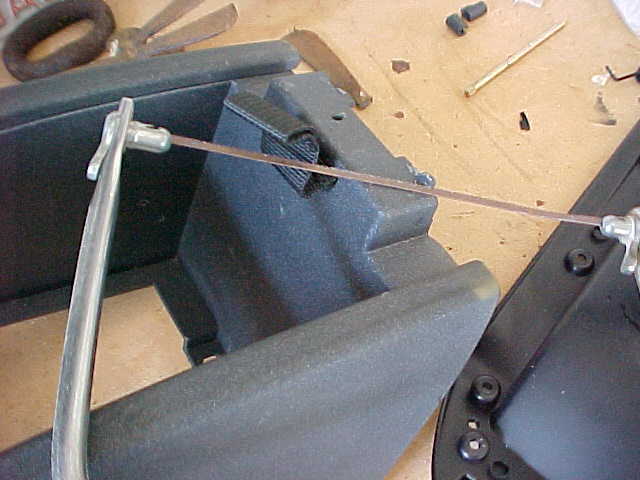 It is quite easy to slip the metal braces into the bottom piece without removing the console. My lid was already broken off, so I was able to put it in a vice to remove the pin, which might have been tricky if it was still in place. Quite an easy fix, good luck to anyone attempting it. Easy job except for the little bit of contortion required. I didn't remove the console; just the pop off cover behind the 'oddments tray' cover. I sat in the back seat with the front seat moved all the way forward. I replaced my hinges without removing the center console either. 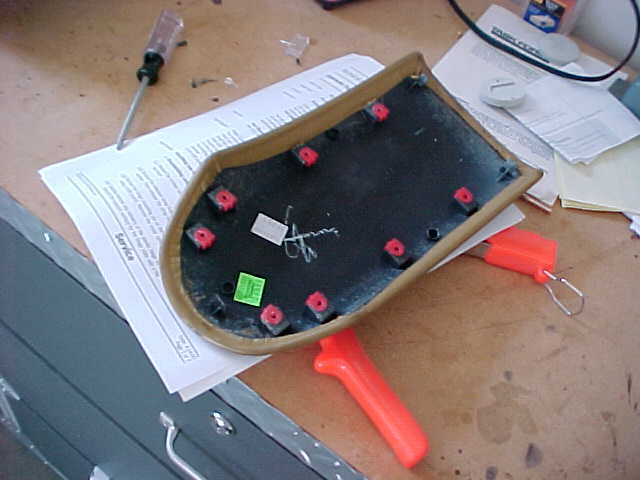 It did help to use needle nose pliers to install the "U" shaped aluminum backing channel in. I also went one size up in the river . I thought the factory rivet was too small. I just ordered the repair kit today. Thank goodness for the DIY tutorials. 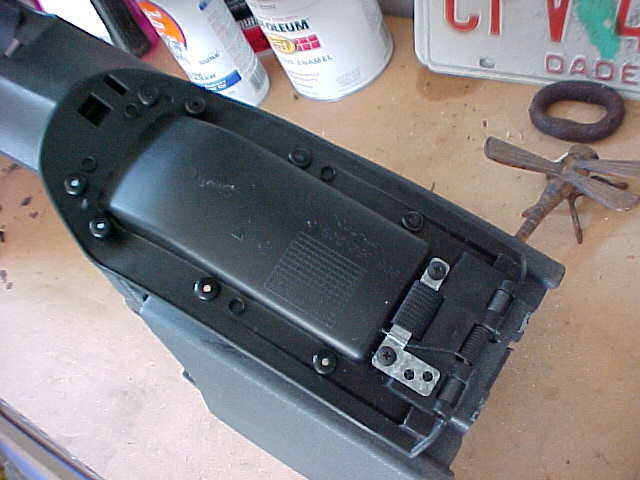 I replaced the hinge on the center console today. After reading all that was available, I went with doing it without removing a lot of stuff like the TSB. All done sitting in the back. Not hard to do. You will have to take a hack saw blade and cut off the unbroken hinge collar, then file both spots till they are flat. 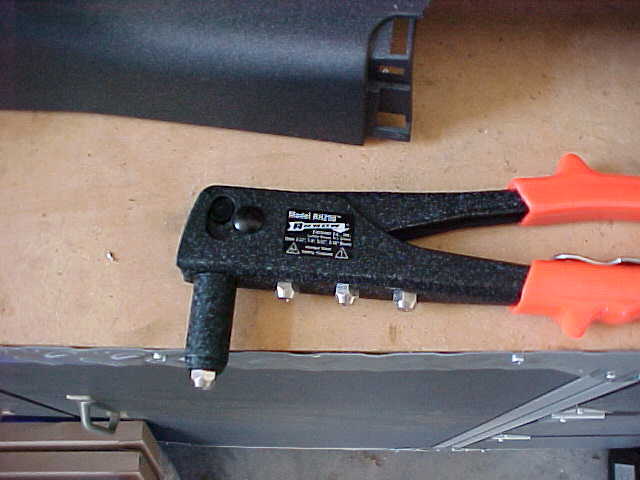 The U shaped rivet supports take a needle nose plier to put in place. Knock the shaft out from right to left. Vacuum the aluminum curlies out after you do the drilling.